Our journey back started early with a 6:20 am departure to Khanty-Manisysk airport, we flew to Moscow and then London for our trains back to the North of Scotland. 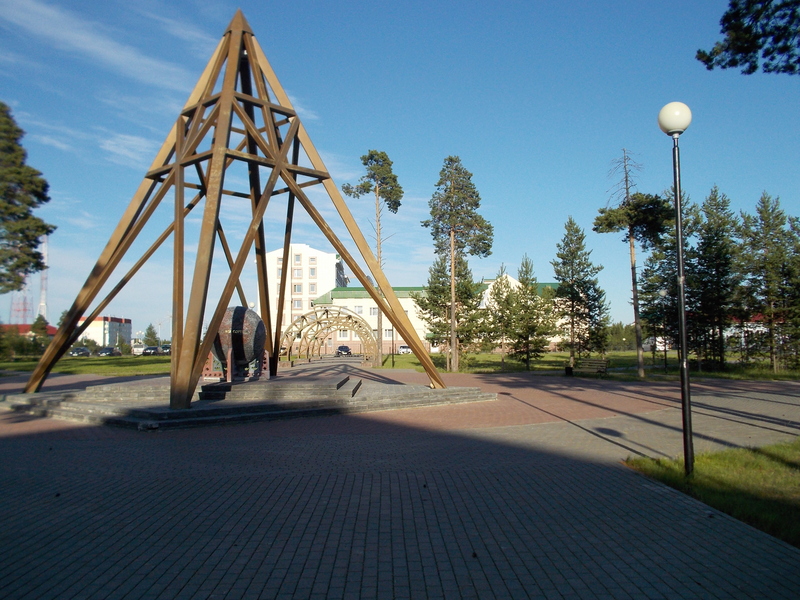 We wish to express a big thank you to Yugra State University and everyone from group of Environmental Dynamics and Climate Change for hosting us and looking after us so well during our stay in Siberia. 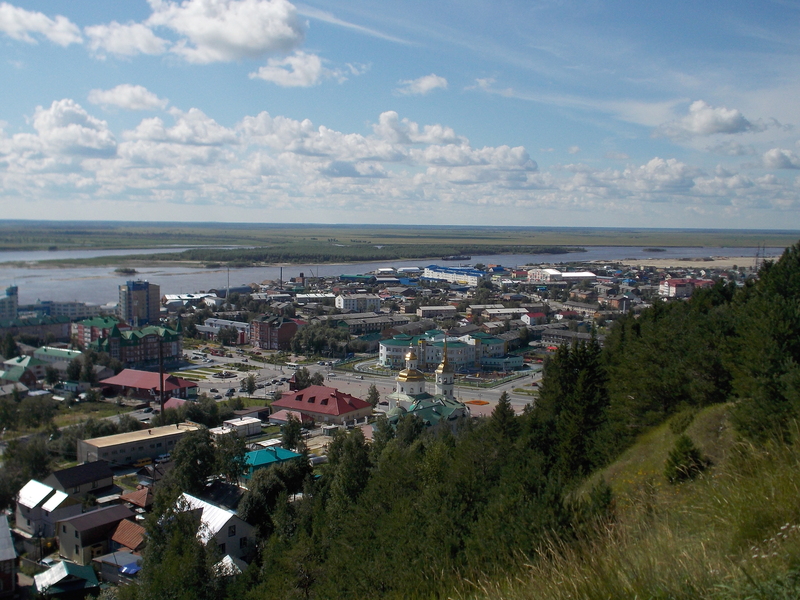 We have had a very enjoyable and productive trip to Siberia and we look forward to continue working on this project! 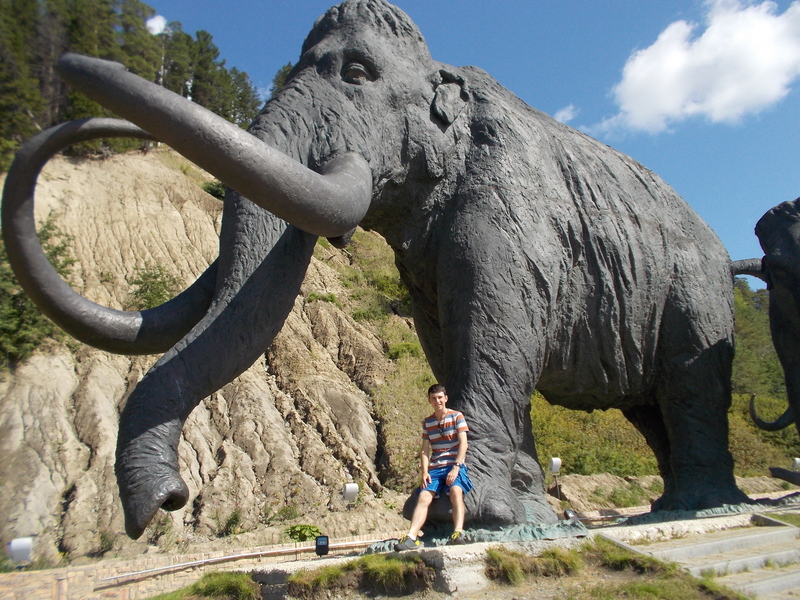 And we are equally grateful to INTERACT TA for funding out research in Siberia! Our final day in Siberia was a cultural tour day. 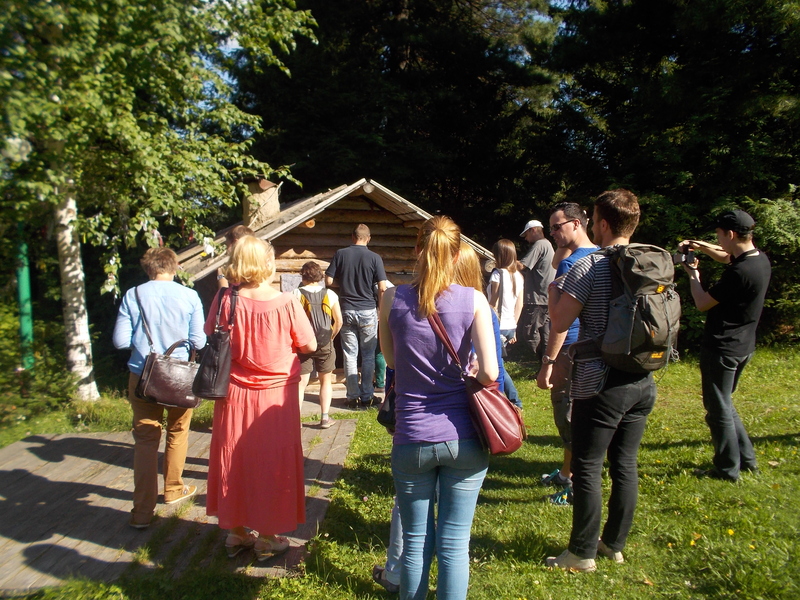 We went on a tour organised by Yugra State University International Office for their summer school students to see around the University and some of the city sights. In the morning we met the rector of the University and then joined in with a tour of the many laboratories, which were well equipped with all sorts of instruments – many of interest to us doing analytical chemistry! 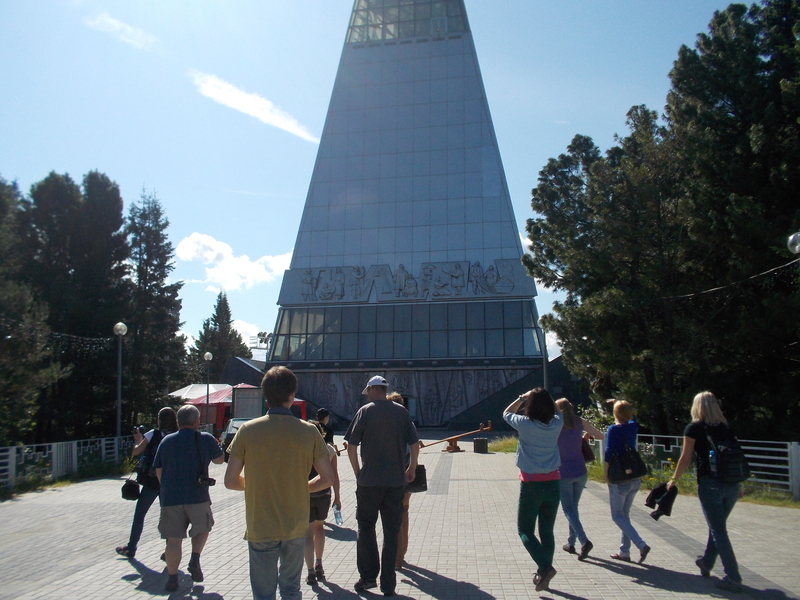 Our city tour took us first to a large glass tower, a bit like the London Shard, then, to see Mammoth Sculptures, the main church in Khanty-Manisysk and finally an open air museum describing the life of the native people of Khanty-Mansiysk, some of whom still live in a very simple fashion today. On Saturday we completed our fieldwork at Mukhrino by taking in our first round of BVOC samplers and measuring the soil water pH and conductivity. In the evening Roxane prepared the final sauna for after dinner. When I went for the sauna there was some torrential rain – it made for a great cooling shower! We left Mukhrino on Sunday afternoon to come back to Shapsa – this time we first had a journey in the argocat – as the boat was not able to make it very near to Mukhrino. This was a cool journey – the argo coped with any surface it seemed and was pretty speedy too! 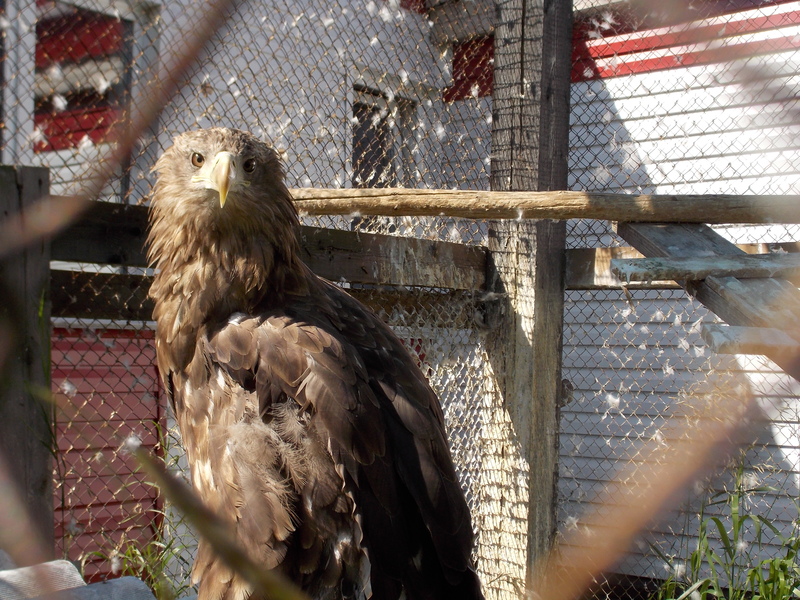 We had four sightings of white tailed eagles while on the argocat. 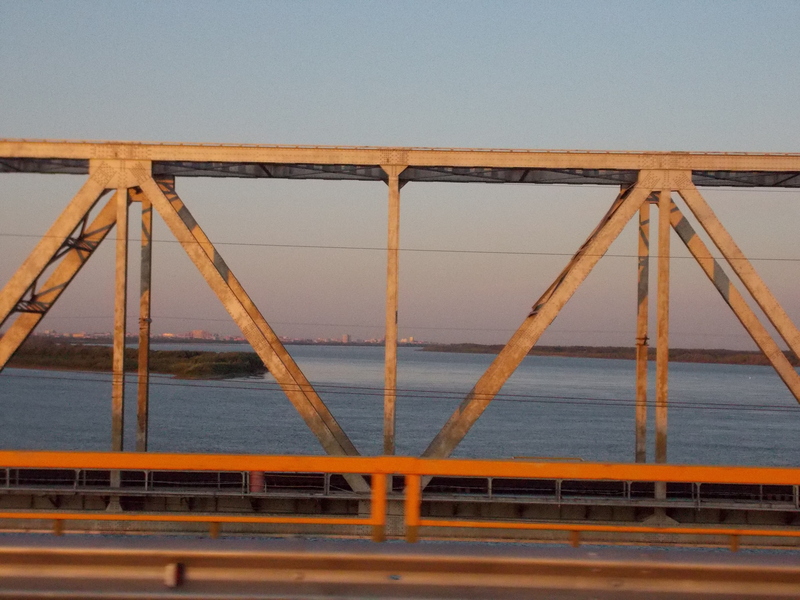 Day 15 – Fri 15th Aug – A long boat ride back to Mukhrino and a Russian party! Today we are visiting Mukhrino field station for the final time in our trip. 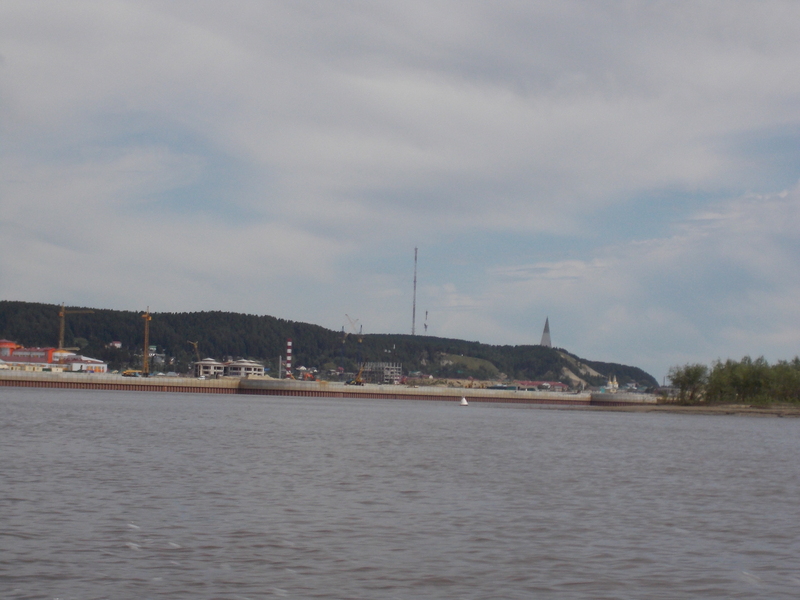 We left Shapsha and headed to Khanty-Mansiysk for the boat trip out. 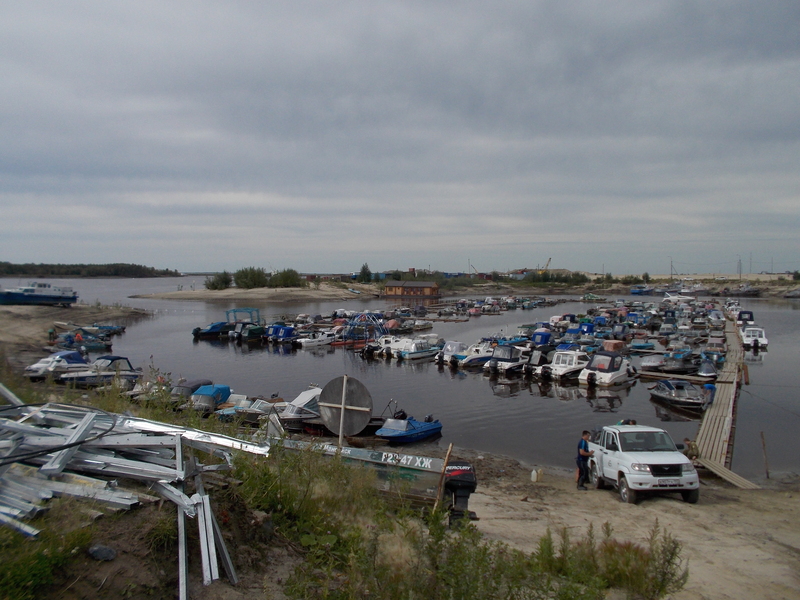 Instead of going to the previous pick up point across the Irtysh River, well out of the city, we went with Yaroslav to the city marina where the University boat was moored. 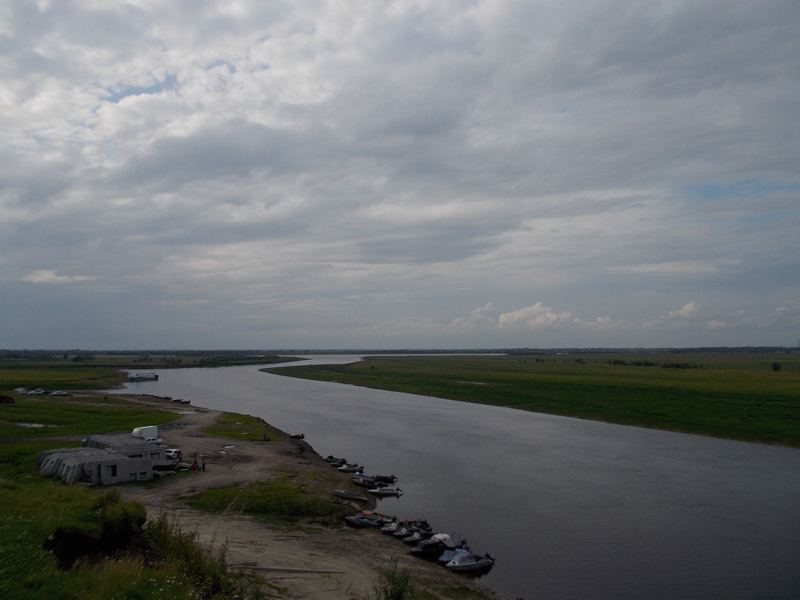 We left here and headed out onto the Irtysh River, giving a pretty view of Khanty-Mansiysk and then headed up a small tributary onto a larger one and sped along to Mukhrino. This was about an hour in the boat in the sun and approaching Mukhrino, the water level was even lower but our captain skilfully navigated the shallow channel. After a lunch at Mukhrino we went to our field sites and put out another batch of passive samplers to be left collecting BVOCs for 1 month. The weather was again sunny and mosquitoes were low. There was also time to use the sauna before dinner. 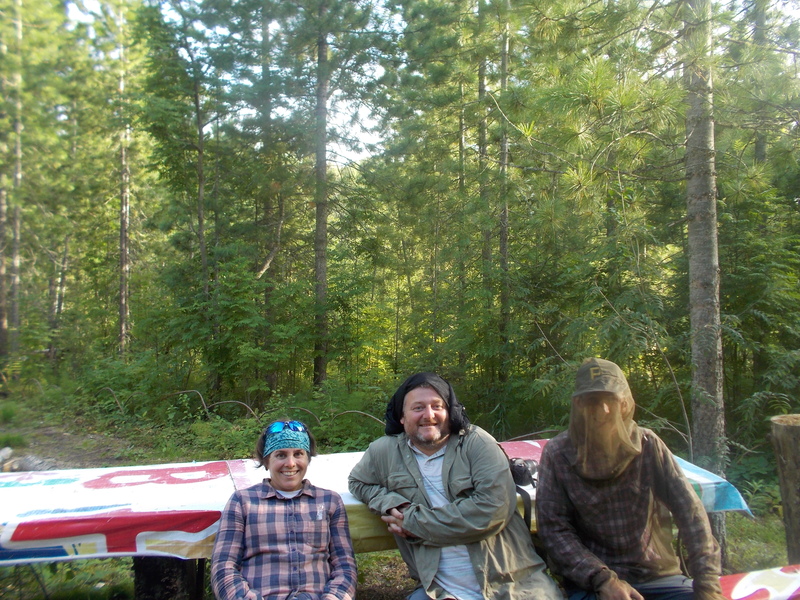 Late in the evening we were joined by Yaroslav and some of his colleagues who had come for the weekend to do some work at Mukhrino and some hunting and fishing. 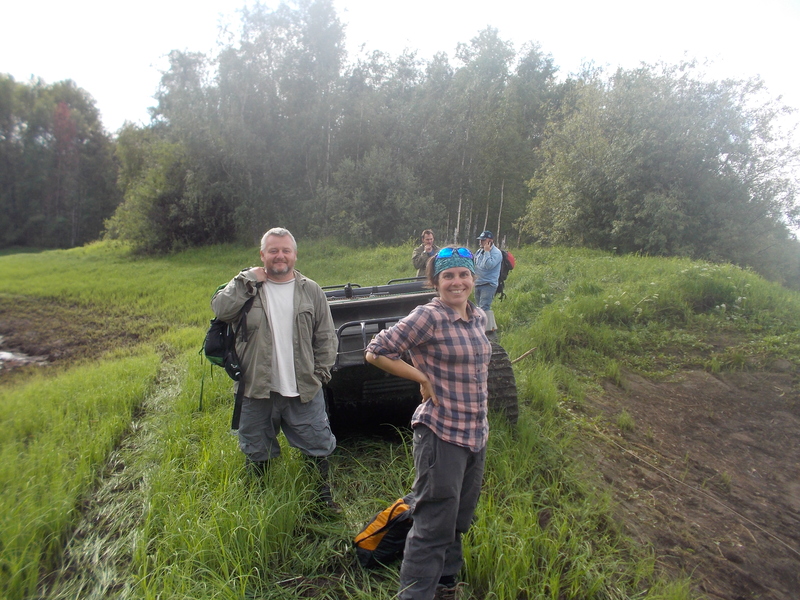 We had a party in the field station with Russian vodka and music into the early hours…..
Today we are having a repeat of our first day back after Mukhrino. 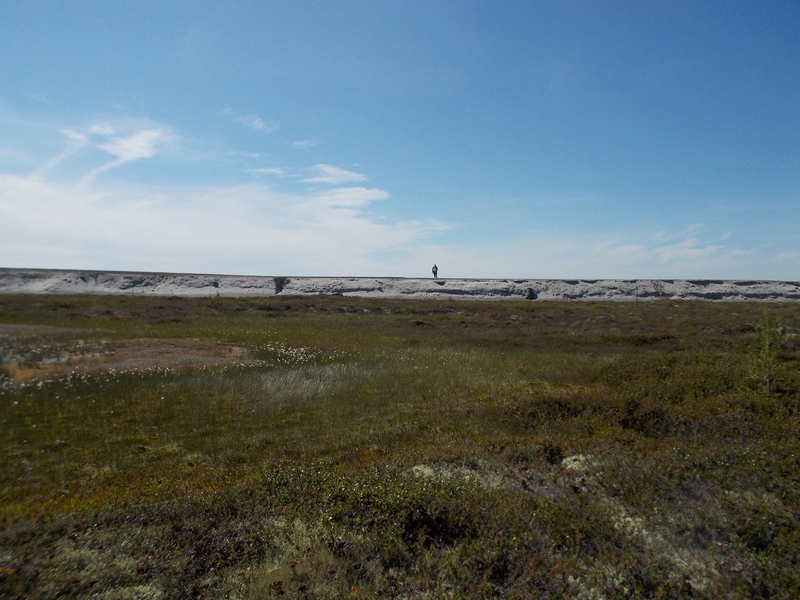 Sorting out the peat samples and drying the vegetation in preparation for C and N analysis.It’s also a chance to update the blog as we have good internet here! It’s very sunny at the moment; hopefully it will be as warm as first time round and there can be some time at the river bank later on! 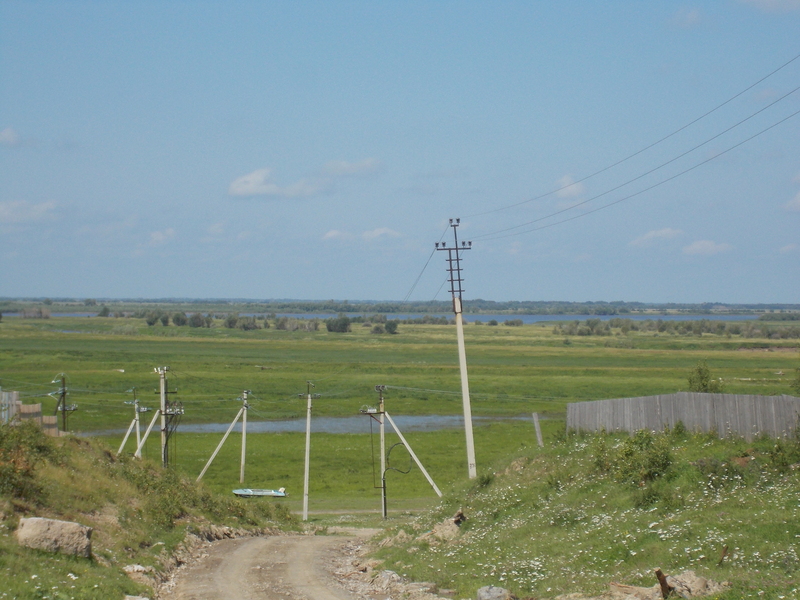 Day 13 – Wed 13th Aug – Fieldwork in Nymto Park and a long journey back! Today we had an early start to the day and were off for fieldwork at 8am! Roxane, Mark and I were all working together so we got through a lot of work quickly. Roxane did vegetation surveys, while Mark and I collected and filtered water samples and made the other measures like pH, temperatures. 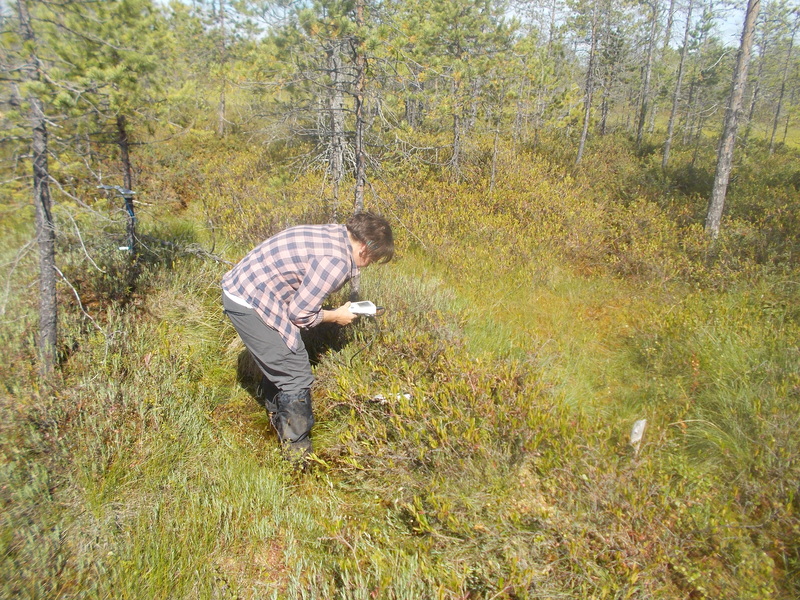 At each site, we finished with Roxane collecting peat samples for a global microbial project. By lunchtime we had almost completed three sites and walked between them too! We had lunch and then decided that we could begin our journey back today, rather than spend another night in the oil accommodation, where there wasn’t too much to do! After lunch we went with the car to the third and fourth fieldwork sites, and finished all our work. We then packed our bags and left the accommodation at 4pm for a very long drive back. When we left it was still 19 °C and was very bright and sunny which made for a beautiful drive back. After about 4 hours we were very close to running out of fuel: we made it to a petrol station with little to spare… After that we continued on towards Surgut and then turned off for Khanty-Mansiysk. About 10pm we stopped for dinner at the same diner we ate at on the way to Nymto. This time the food was even better. Yaroslav got us some beers for the rest of journey back, which was about another 2 hours… I fell asleep though! We arrived back at Shapsha field station near 1am. It felt so homely coming back to here again now and the bed was very welcome after our travels! Now that we were loaded with our special permits, we got through the checks into Nymto Park and drove to our base for the night, which was about 3 hours away. This was at first a journey through a mixture of bogs and some very sandy soils which made me think of a desert. After a while this turned a vast expanse of bog, with forested birch and pine areas. The trees in general seemed a bit smaller in places but they were still plenty about! The road also changed from a smooth surface, to large concrete blocks joined together so became a bit more rickety! 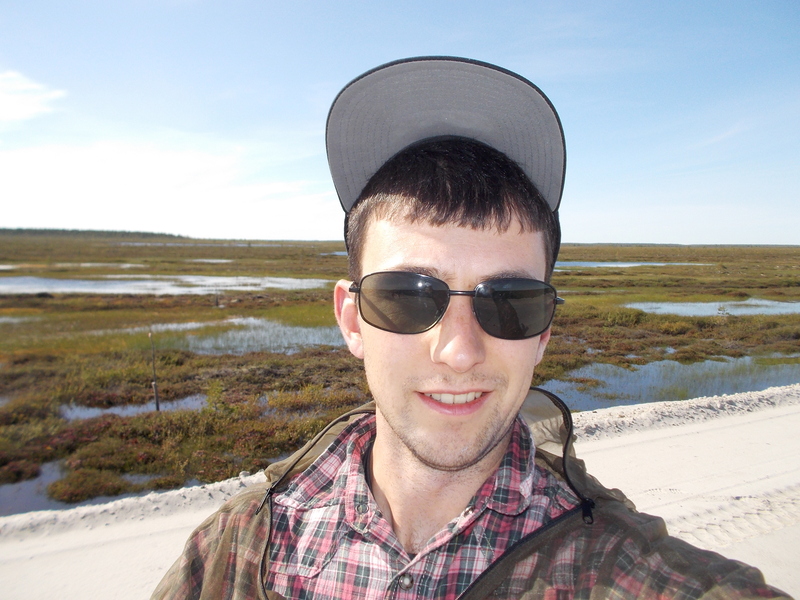 Yaroslav had to do a bit of persuasion at the check points because we were ecologists coming into the oil development area but we are here to study natural processes and in the end we were OK because permission had been granted by the boss in Surgutneftegas. We had a similar situation at our accommodation! 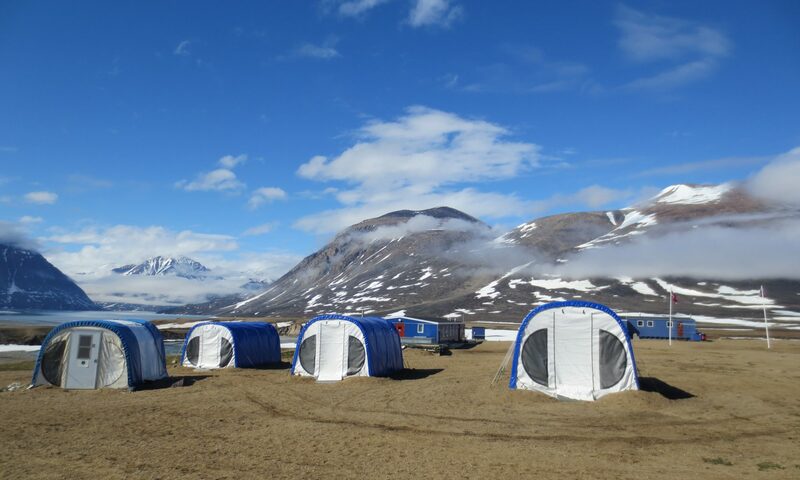 We could not go to the Nymto Park Field station because of oil prospection work going on there, so we had arranged to stay at the Oil Workers accommodation. We had lunch there in the cafeteria and then went out into the peatlands. Yaroslav and our driver dropped us off a bit further north and we went to choose our field sites and then walked our way back for dinner. 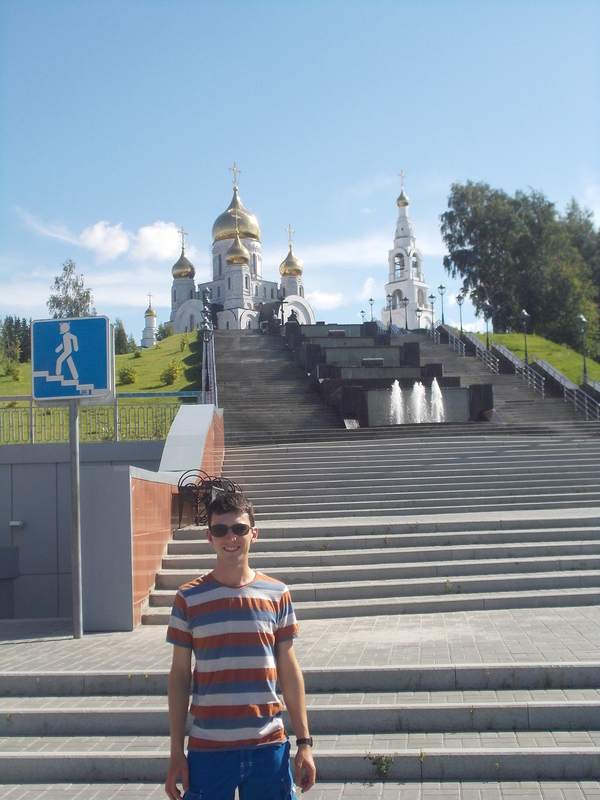 During this time Yaroslav spoke to the site manager about us staying in their accommodation. 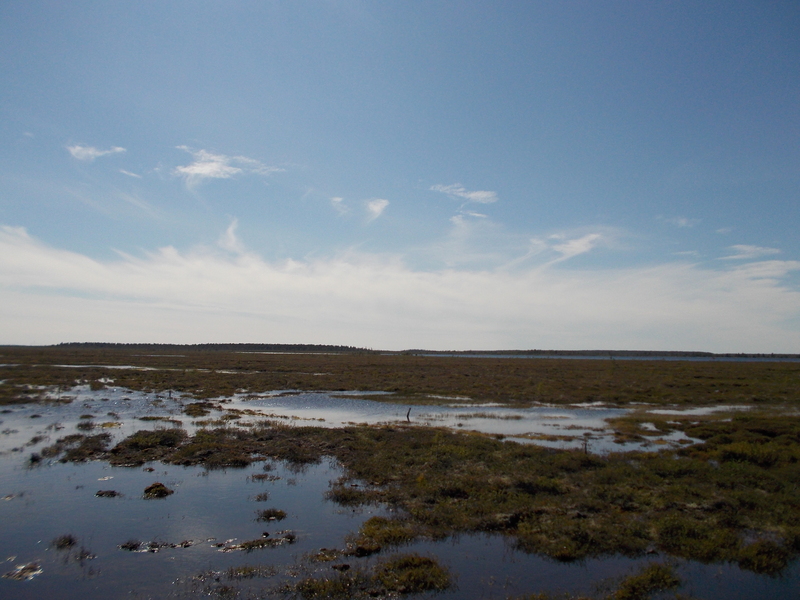 The peatlands of Nymto Park were very beautiful; lots of large pools, small pools and areas of Ryam. 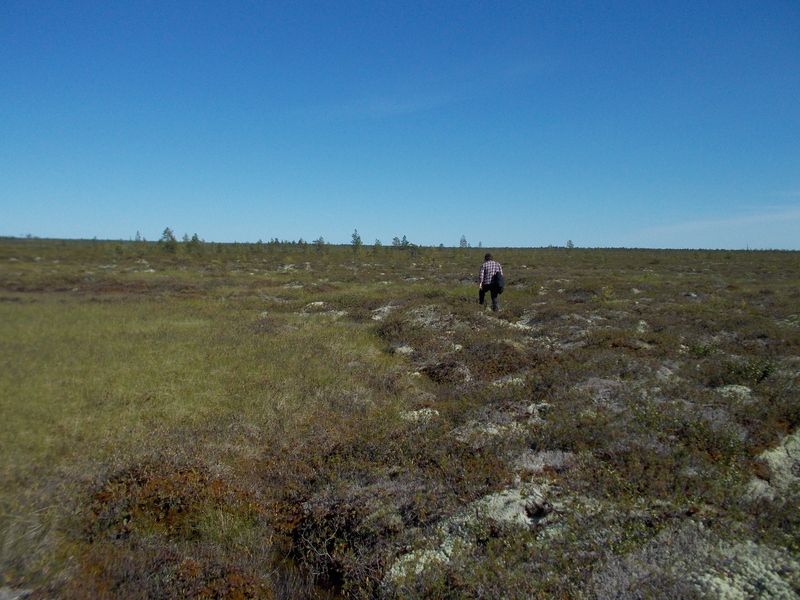 We had chosen a similar design to Mukhrino and marked 4 locations where we collected water and vegetation samples at each location from Sphagnum lawns, ericaceous shrubs hummocks and treed hummocks. We dug small holes to measure the water table the following day. The sites were spread along about 12km. 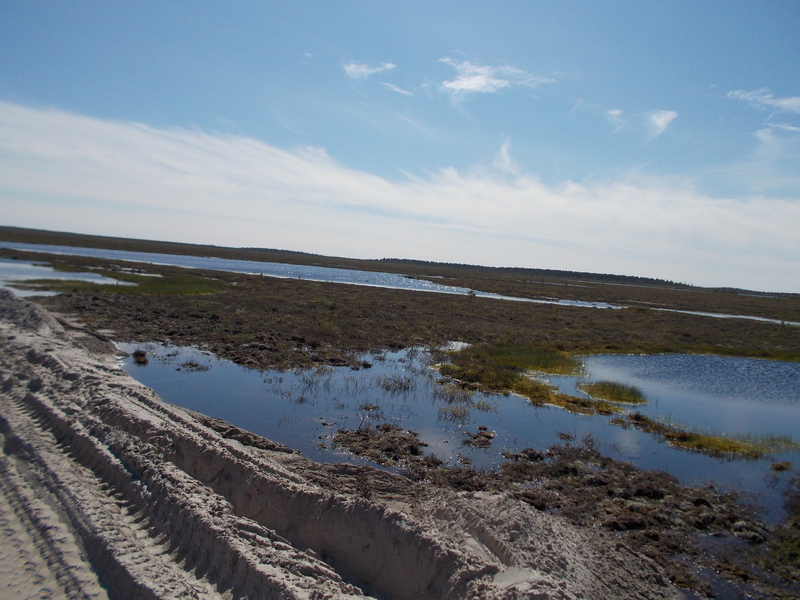 It was not too hard going however as we were able to walk on the rickety concrete road through the peatlands, with the first site at the road end. That evening, after dinner we were invited to have tea and biscuits with the site manager at our base. Yaroslav came too and he acted as translator. The site manager asked about our project and work here and in Scotland. He told us a bit about himself too and we had a really good chat with him. He gave us lots of tea and biscuits also, which was a good round off to the day. Day 11 – Mon 11th Aug – North we go! Today we began our journey to the second field station we are visiting – Nymto Park. Nymto is 63 °N, while at Mukhrino and Shapsha we are 61 °N. We started our journey at mid-day and headed east towards the city of Surgut, on the way there we stopped at a Russian roadside diner – this had some pretty tasty food. 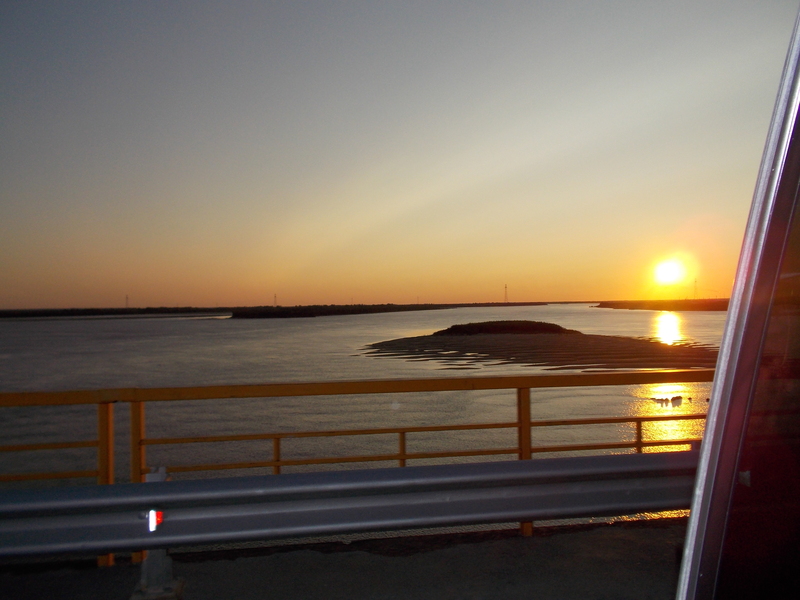 Once we were about 10km from Surgut we turned north and headed for Nymto. 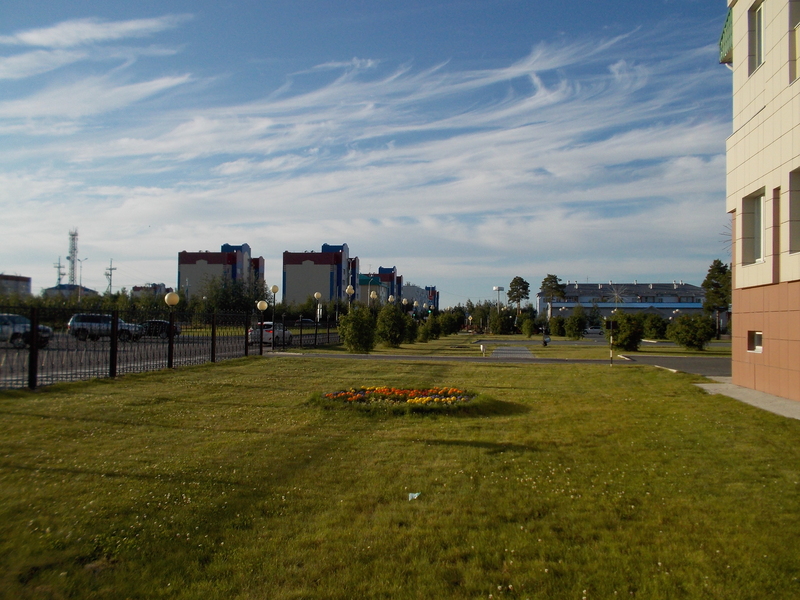 The first stage of our journey was to stop at a rather new town called Surgutneftegas, literally, Surgut oil and gas, which is a centre for workers in the oil and gas industry in the area. It was built only 25 years ago. On the way there I was quite surprised by the scale of the oil and gas developments in the area. We had to stop at Surgutneftegas because in order to proceed north into Nymto Park, we needed a special permit to pass through the checkpoints set up by the oil and gas industry. We arrived in Surgutneftegas at 6:02pm, however the office issuing the permits closed at 6pm. Yaroslav who was our guide for the trip, said this was ok, we would just stay the night in this town! We first all went for dinner in a special restaurant for the oil workers where everything was subsidised and then checked into our hotel! Roxane and I did a bit of exploring around Surgutneftegas and found a few shops, including a hardware one. That evening I watched some Russian TV in the hotel room – some kind of drama series with Mafia type characters, it went on for about 3 hours and I then went to sleep before the end! 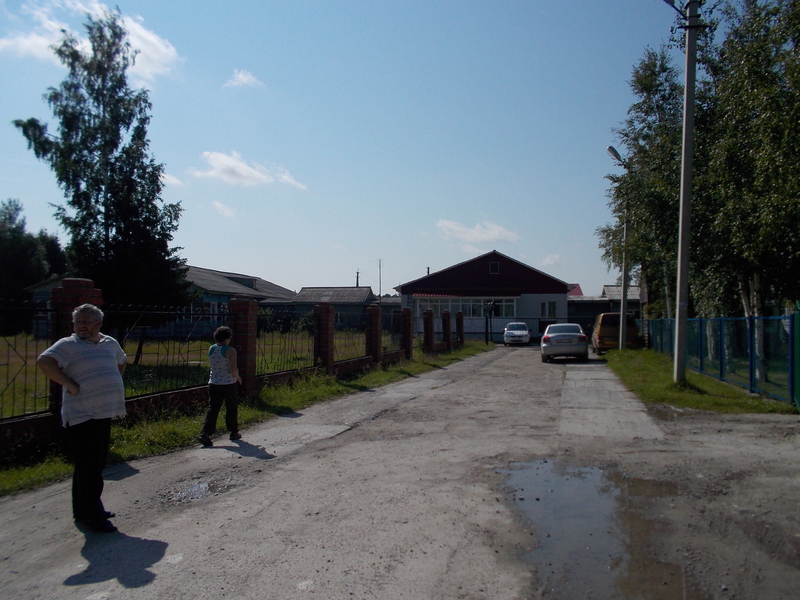 Today we are in Shapsha again, a good chance for me to catch up on computer work. 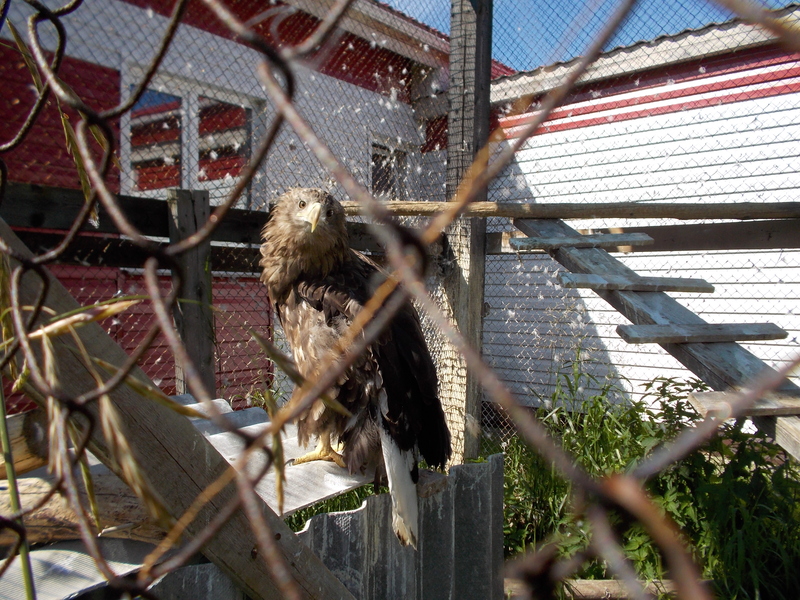 Outside the field station there is a white tailed eagle with one wing, which was rescued and has been living here for the past years. He is quite a happy looking fellow and likes looking back when we watch him! In the morning there was some lab work to do: drying of some of the vegetation samples we had collected and some subsampling of peat cores taken from our measurement sites at Mukhrino. After lunch we had a walk around Shapsha village which seemed very small and quiet. We later heard lots of loud music coming from nearby and went out to explore, this was from a private party in the nearby small animal zoo, although they also had three Brown bears in cages. This second trip around Shapsha was more successful in that we found the location of both shops and went in to one of them to buy snacks! I was really after a packet of crisps and they had a good choice of crisps and plenty other foods in store. We then walked towards the river (a large tributary of the River Ob) and found many people along the floodplain spending the day there. There was people fishing and boating, swimming and having barbecues and it made the village of Shapsha seem quite a bit bigger than the first walk! In the evening Elena Lapshina, our host here, came to join us and brought some Vodka for toasts with our meal, it was the last night for Richard, Joss and Angela, who return home tomorrow. Myself, Roxane and Mark however, have another 10 days and a new field station to visit a few hundred kilometers north.